Posted Oct 11, 2018 by Eds. Brazil’s Socialist Party and the Socialism and Liberty Party (PSOL) have both endorsed Workers’ Party (PT) candidate Fernando Haddad, who will face off with far-right-wing candidate Jair Bolsonaro in the second of Brazil’s presidential election is scheduled for Oct. 28. Both parties responded to a call by activists and left-leaning politicians to support Haddad, who gained 29 percent of the votes in the first round to finish second behind Bolsonaro’s 46 percent and form a coalition to stave off Bolsonaro’s authoritarian bent. Despite not presenting a presidential candidate, the party got 32 seats in the lower chamber of Congress and five in the Senate. While an official statement, from the PSOL said: “the second round is the continuity of the fight against fascism and the coup; the main task now is therefore to defeat Bolsonaro.” Its presidential candidate, activist Guilherme Boulos, reached 10th place with 617,000 votes, roughly 0.58 percent of the electorate. Boulos announced Wednesday the alliance between the PSOL and the PT includes four programatic pacts. Haddad will include PSOL proposals as part of his political platform on women’s rights, against political impunity, on housing rights, and proposals geared towards helping majority Indigenous and Afro-Brazilian populated territories. The proposals also include criminal punishment for companies that pay women less than men, the demarcation of ancestral territories, and the construction of 100,000 housing unit within the first six months of government. 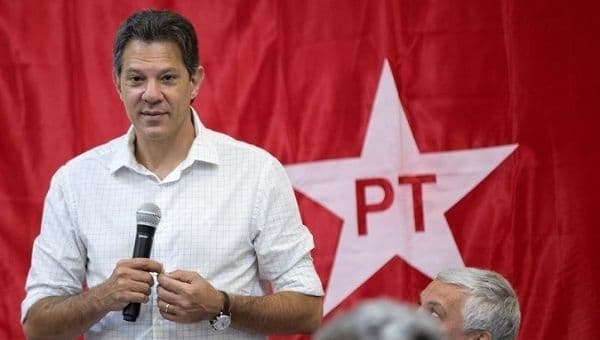 Haddad has also received the support of the Democratic Labor Party (PDT), whose candidate Ciro Gomes came in third place in the elections reaching over 13 million votes, roughly 12.5 percent of the electorate. Gomes condemned Bolsonaro on election day saying: “No doubt, Not Him” and “my life story is a life story that defends democracy and against fascism.” On Monday, the party’s president Carlos Lupi announced the party would support Haddad despite the political and policy differences between the parties. Haddad will also be hoping to gain the support of the 7,990,724 voters who cast ballots for other presidential candidates, and some portion of the almost one-third of Brazilian voters who either stayed home or cast blank or null ballots. According to official election results, 3,106,916 voters registered blank ballots, 7,206,162 registered null ballots and 29,937,375 abstained completely. Haddad’s best chance of staging an upset, observers say, is to motivate those voters to cast ballots for him.